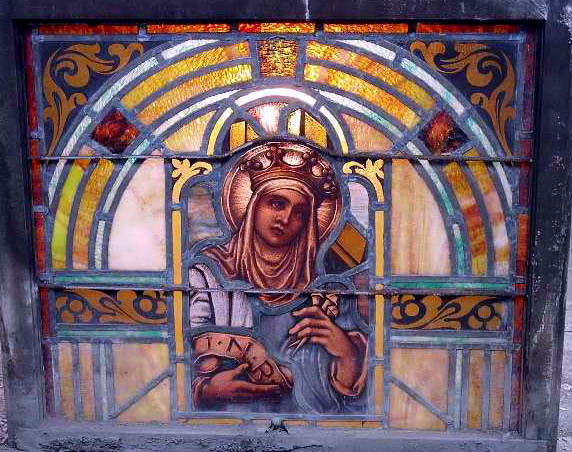 Description: The impressive five generation-long history of this studio began when the H. Oidtmann Glass and Mosaic Studios were founded in Linnich, Germany in 1857 by Dr. Heinrich Oidtmann I (1838-1890), who started his career in medicine before turning his interests to the business of stained glass. Dr. Heinrich Oidtmann II (1861-1912) and Heinrich Oidtmann III (1888-1929), a doctor and engineer respectively, both published prolifically in scientific texts and works on stained glass. After Heinrich Oidtmann III's death in 1929, his wife Ludovika (1899-1945) managed the business through Germany's difficult years of depression and war, allowing the business to pass to further generations of Oidtmanns. Today the company's legacy is maintained by Heinrich and Dr. Stefan Oidtmann, grandsons to Heinrich Oidtmann III and Ludovika Oidtmann.